Subaru takes a serious step forward with its new Crosstrek, a small crossover that mates sporty styling with practicality and moderate cost, a winning combo. 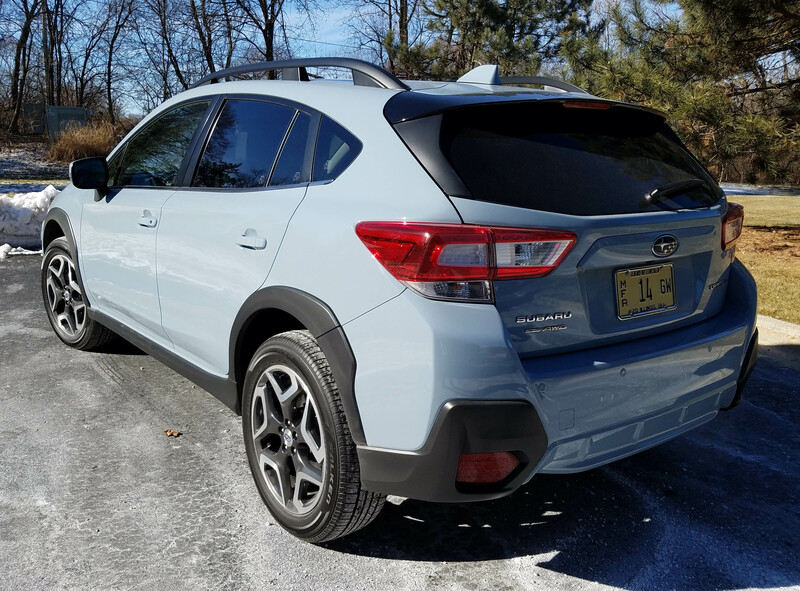 While the former Crosstrek was sporty, it rode worse than most trucks with a choppy ride that spoiled its otherwise useful and economical underpinnings. Now the Crosstrek joins the big leagues of small crossovers with sporty handling and a good ride. It features a 104.9-inch wheelbase and touts 8.7 inches of ground clearance, so it actually could go off road. There are Stablex dampers to soften the ride too. Based on Subaru’s Impreza platform, Crosstrek’s chassis is much stiffer than its predecessor and the little ute, if you please, rides about 2.5 inches higher than Impreza’s hatchback, also a cute and useful vehicle. Mine was the up-level Limited model in a powdery blue-gray that got a lot of comments, especially from women of all ages and young office co-workers. Subaru adds Vehicle Dynamics Control, a brake-based torque vectoring system, to Crosstrek that helps it handle better. The test ute zips through corners quickly and easily with only a slight touch of body lean. Yet it rides like a midsize sedan and better than many utes. Steering is light and easy due to a quicker steering ratio and power assist system. It’s precise enough to pass as sporty as there’s little play in the wheel, unlike last week’s larger Nissan Rogue whose steering felt numb. 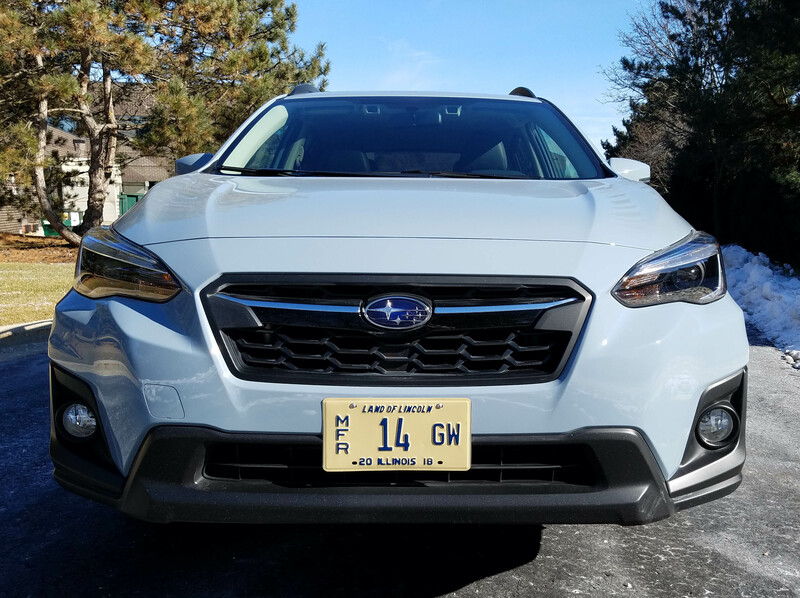 Being a Subaru the Crosstrek comes standard with AWD, a perfect fit for Wisconsin roads, especially the last couple weeks. 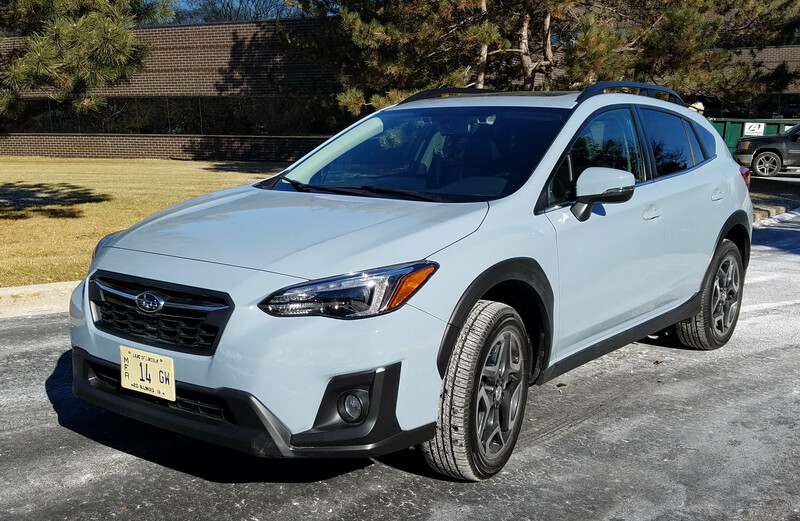 My test car arrived on a dry sunny day, but two days later we were shin-deep in snow and the Crosstrek was as surefooted as any larger SUV I’ve driven. Yet it felt light (and is at 3,113 pounds) and sporty, so a fun drive on dry or sloppy streets. Power is up slightly, 4 horsepower, from the previous Subaru 2.0-liter Boxer 4-cylinder engine. This one is substantially new, runs quiet and is well mated to the 7-speed Lineartronic CVT. The engine never sounded over-taxed like last week’s Rogue. 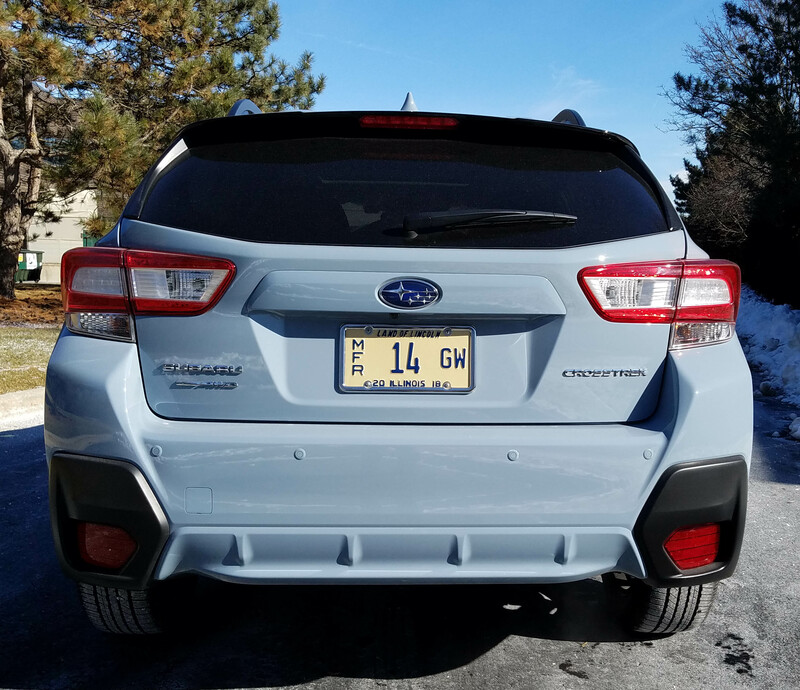 But even with its improvement from the earlier Crosstrek, the 2018 has just 152 horsepower. Acceleration from a stop feels modest under normal acceleration. However, if you jam the accelerator to the floor it’ll get up to city driving speeds well enough as the low-end torque comes on fairly quickly. Plus this Boxer engine does its work without any moaning or groaning. Still, if you want a powerful crossover/ute, this isn’t it. Subaru also offers X-Mode in the models with a CVT, as this had. A 6-speed manual is standard on lower end models. X-Mode, which sounds like a Marvel superhero, locks the transmission into lower gear ratios to aid in off-roading, and adjusts the stability control system likewise for muddy romps. There’s even hill descent here so you can crawl down a steep incline when you and your friends are returning from a strenuous hike or rock climbing outing. Luckily, when you’re back inside on the ride home it’s quiet in here. Helping that is the car’s sound insulation windshield. Plus the dash is laid out well, so easy to use and understand. Likewise, Crosstrek’s interior is well appointed. For instance, my test car featured black leather seats with orange stitching that reflects the car’s target market, young, outdoorsy car buyers. There’s also orange stitching on the dash and leather steering wheel, plus satin chrome trim on dash and doors. Small carbon-fiber pattern inserts decorate the door handle surrounds and the console-mounted shifter has a black gloss surround. 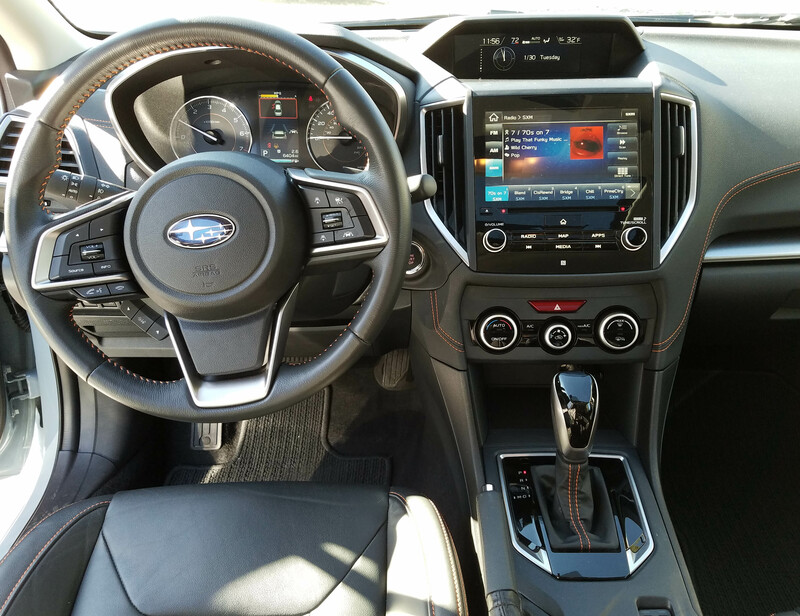 Also standard on the Limited are heated seats, a big 8-inch radio/nav touchscreen, rearview camera, blind-spot detection system, 6-way power driver’s seat and Subaru Starlink emergency service system. The dash’s simple layout makes it easy to see and find all the buttons and knobs, even as you drive. This is becoming a bigger issue as cars and trucks load up the dash, console and steering wheel hub with more and more buttons that are not intuitive. So congrats to Subaru for keeping this simple. My test car added just one option, the EyeSight package, which includes a sunroof, navigation system, Harmon Kardon stereo system with 8 speakers, and EyeSight, which is Subaru’s driving assistance system. It watches ahead of you for stopped cars or objects in your vehicle’s way to warn you and apply the brakes automatically to limit accidents. It also incorporates smart cruise control and lane departure warning. It all works fine, but adds $3,445 to the car’s price tag. The good news is that Crosstrek starts at a modest $27,210, with delivery fee, for the Limited model. The test car was $30,655 including EyeSight. 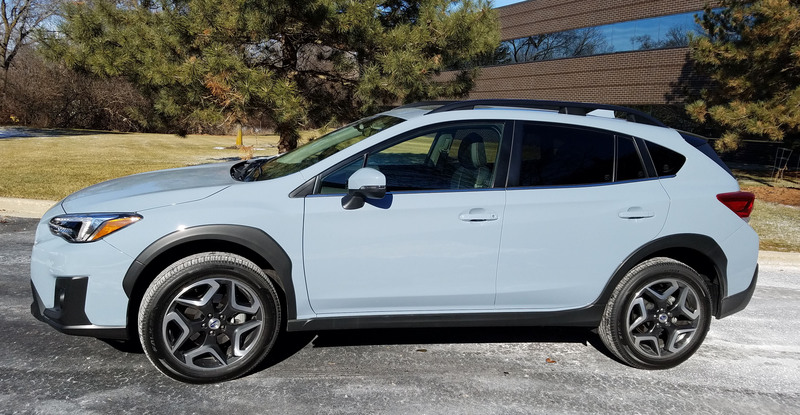 A base model starts at $22,710, so Crosstrek is high on value considering the average new car now costs about $32 grand. Gas mileage also is decent for an AWD crossover. The EPA rates it at 27 mpg city and 33 mpg highway. I got just 24.0 mpg in bitter cold weather and mostly snowy conditions. Just a few other parting thoughts to consider. 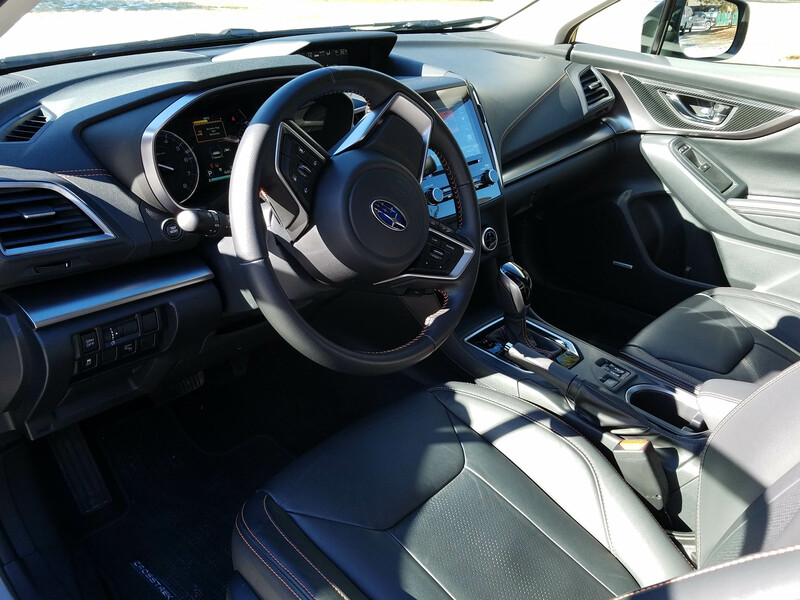 Crosstrek’s seats are comfortable and the driver’s is powered, but has no lumbar adjustment. Subaru seats always run on the firm side, but they are supportive for the lower back and hips. Back seat room is reasonable too, so there’s room for four adults, plus a large cargo area under the hatch, which includes a wiper. Overhead the sun visors also have extenders. I know you were wondering about that! What Crosstrek doesn’t have, but should, is at least an optional heated steering wheel. And for that matter it needs a flat-bottomed wheel that looks as sporty as the rest of the vehicle. But it features steering responsive headlights, which help light your path round corners on dark roads. The big nav/radio screen is part of a Starlink system that includes smartphone integration, Bluetooth and satellite radio. Push-button start is standard as is an automatic climate control system, fog lights and the usual assortment of trip computer, radio and phone buttons on the tilt/telescope steering wheel’s hub. Crosstrek is a delight to drive, economical and loaded with features to make it a sound value in the small crossover market. Where it stands out is in driving dynamics, looks and all-wheel-drive traction for mild off-roading. Hits: Sporty handling, good ride, well-appointed/laid out interior, hatch and AWD. Heated seats, sunroof, big nav/radio screen, simple dash layout, visors extend and solid safety devices including rearview camera, blind-spot warning and Eyesight. Misses: Mild power, but good low-end acceleration. Needs a heated steering wheel and flat-bottomed sport wheel.